Hurry over to get NBA 2K19 on Xbox One, PS4 or Nintento Switch for $27 Shipped (Retail $59.99). 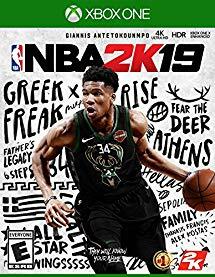 NBA 2K19 celebrates 20 years of redefining what sports gaming can be, from best in class graphics &amp; gameplay to groundbreaking game modes and an immersive open-world "Neighborhood". NBA 2K19 continues to push limits as it brings gaming one step closer to real-life basketball excitement and culture.